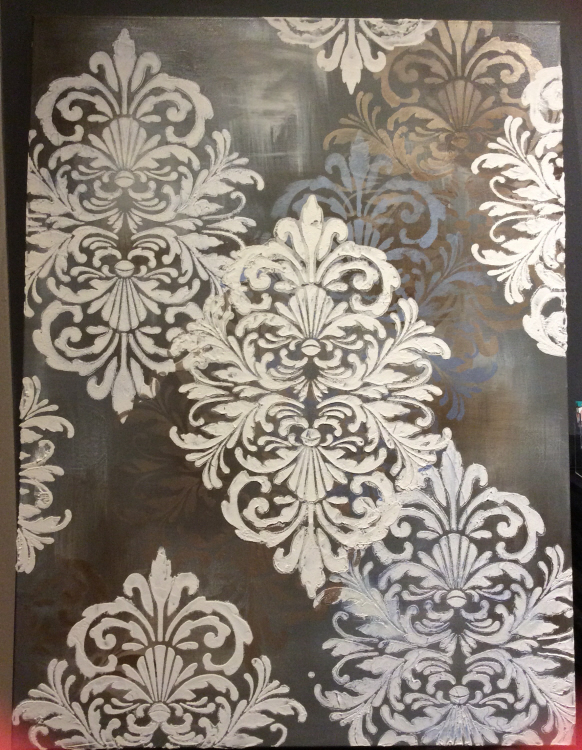 The creative Anna Krause of Collage Design Studio created this luscious canvas art for the walls of Spa Serenity.She used our Raised Plaster Bella Medallion Stencil for the design element. The canvas was first painted using dark paint then the stencil was cleverly layered over the top in different colors. Look closely and you will see the design in blues and brown in the background. “If a customer wants to do the plaster technique on canvas they should stabilize the back (around any stretcher bars) with some 1.5-2” insulation while they are working on it. The canvas, unlike a wall, flexes so it creates it’s own set of issues. I didn’t stabilize when I worked on this piece but I have experience-a newby would be frustrated and unhappy with the product. It would also help to lay the canvas flat. My own advice is to use a product called “Golden’s Hard Molding Paste” when you’re doing canvas art. This is a product you can purchase at your local art or crafts store and remains flexible even when dry. It won’t crack over time and you can pre-tint it with any acrylic paint. I love layered designs and this beautiful art just goes to show you how a single design can fill up an entire canvas and used as artwork or to create a beautiful layered wallpaper design.